Today is day four of our two-week Saint Michael caravan prayer tour. After arriving in Arkansas, the Saint Michael caravan did its first campaign in Conway. With the recent attacks on the police, we rallied the locals to support their law enforcement officers. The reaction of the public was overwhelmingly sympathetic, honking, waving, and giving thumbs up. We didn’t receive any negative gestures or words. I woke up this morning with fear… as I do most mornings. My husband is a police officer and I never know if today is the last day he will go into work, never to come home again. With all the hatred toward them, that fear has only grown and sometimes I selfishly wonder why he does it. As I dropped my 2 little girls off today at their grandparents I saw you guys and I just wanted to thank you for the reminder of why he does it. Later we campaigned in Hot Springs, Arkansas. It is a tourist town situated in the Ouachita Mountain Range. One can find a beautiful public grotto in honor of Our Lady of Graces in town. It overlooks one of the main roads. We visited the shrine and noticed that an America Needs Fatima rosary rally banner was on display on the wall near the statue of Our Lady, visible to all passersby. After our rosary rally there, we headed on to the Fayetteville area of the state. 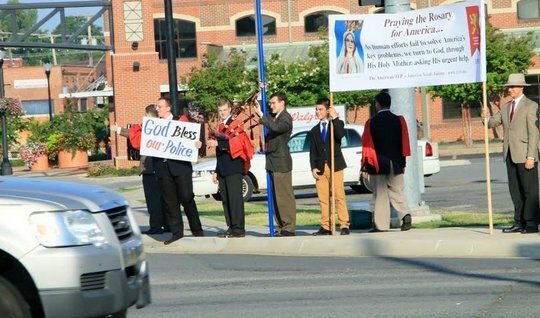 We campaigned on a street corner in front of Wal-Mart’s national headquarters in Bentonville. Many Americans reacted favorably as they drove by. One police officer in Bentonville even asked if we needed water. Later in the day, we campaigned at two different intersections in Fayetteville. On three different occasions people spontaneously brought us water. Since we were in the Bible Belt, naturally a few different Protestants asked us about Fatima – which they pronounce "Fateema." Surprisingly, they were not hostile to the idea of Our Lady’s message and agreed that we need to pray for America and convert, and that we are living in bad times. We will now make our way to Oklahoma City, Oklahoma and then Amarillo, Texas.